If you asked me for my blogging goals, I couldn’t tell you. If you asked me for my after-college plans, I couldn’t tell you. 1.) Blogging will improve my writing skills drastically. Meeting new people and gaining important insight. That’s important because I wouldn’t improve if I didn’t constantly fail at packaging ideas. Longterm, it doesn’t really matter if 5 or 50,000 people read this; I’m improving everyday. 2.) I‘ll study business and entrepreneurship in college. Do I have a specific job I want? Nope. But does it matter? According to statistics, most people have a plethora of jobs scattered throughout their life. The age of the nuclear family is destroyed and with it any stability in the job market. Those days are done. You’re a commodity and so it makes sense to be invaluable. Welcome to the world of systems. You might think it’s dumb assuming systems are better than goals. You might think that happy and well-to-do people write down goals instead. 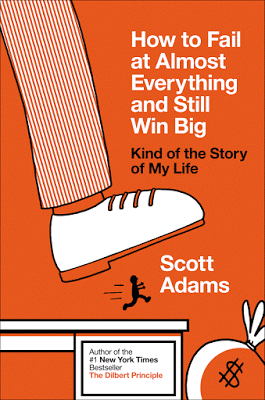 Don’t take my word for it, take it from Dilbert creator Scott Adams, who’s book ‘How To Fail At Almost Everything and Still Win Big’ is a bestseller. Another example is weight loss. Losing 20 pounds is a goal. Eating healthy and exercising daily is a system. Knowing what to eat is important because you’ll lose weight while constantly improving overall health. Losing 20 pounds is important, but not if you can’t keep healthy afterwards. Whatever the situation, the struggle between systems and goals continues. In a world shrouded with business seminars and bad advise it’s important to fail towards success, as opposed to away from it. That mantra is the best mindset for successful and confident people.